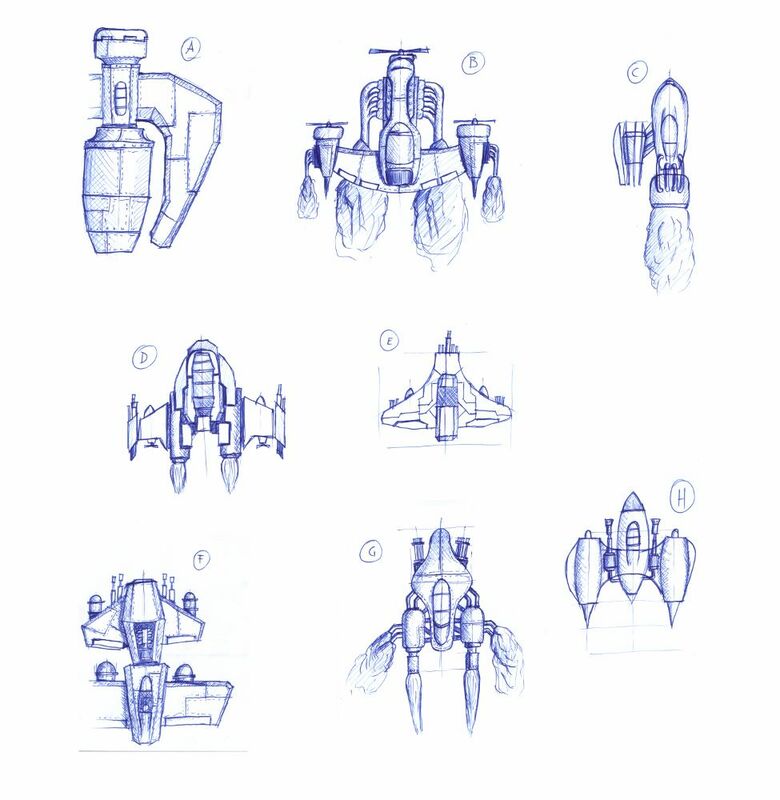 There where quite many answers to my call for your player ship favourites. I’m going to start modelling the finalist tomorrow. I just recognized that the RSS feed shows only the very first blog post. This is because I’ve moved the blog to an URL sub directory after posting the first entry. I forgot to update the Feedburner settings accordingly. Unsubscribe and subscribe again, that should solve the problem. Today I have drawn some sketches for the player ship. Some of them are not complete but the concepts should be obvious. Just assembled the todo list for Nordenfelt 0.2. Man, that is going to be a big load of work! I don’t know which points this version finally will contain but I will start with redesigning the player’s ship. Monday or Tuesday should bring you a list of rough designs from which you can choose your favorites. That’s all for now. Weekend awaits! The last few days were designated to the controls of Nordenfelt. I’ve but some sweat into the mouse and keyboard “drivers” because they make or break a game. Especially action games rely on immediate input processing and comfortable control layouts. The control layout was the most important reason for the input system update. Future versions of the game (OK, maybe not 0.2) will provide arbitrary key/button/axis mapping. You will be able to configure your own input layout and save it. Some people mentioned the rollover problem I did not know before. I thought my keyboard driver was guilty for not working diagonal moves while shooting. This problem should be gone now. The input system passed all tests and the silhouette of version 0.2 appears on the horizon. Coming days will be used for including some new stuff and working through the feedback list. Many thanks at this point to all of you who passed some info back to me. Keep this going! Hi! This is Thomas (aka hermitC) from Black Golem and this is the new blog for the upcoming Steampunk shoot ’em up Nordenfelt. Some of you may have visited this website before. The former layout was a simple information panel with a newsletter subscription form. BTW: Feel free to subscribe to the email newsletter. You can find the subscription form on the right hand side of this blog. Subscribers will always receive news first! This blog is dedicated to players, testers and finally customers. Everything concerning the progress of Nordenfelt’s development will appear here. Everybody is welcome to comment on the development state. Nordenfelt relies on your feedback. Playable demos of the game will be published regularly. The first version (v0.1) can be downloaded from the download page or directly here. 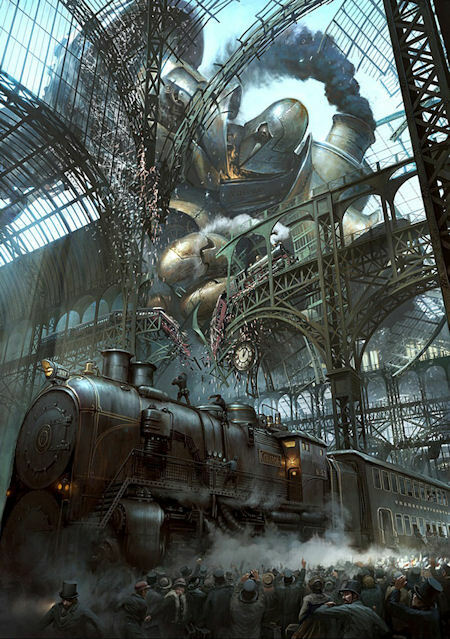 The picture contains many Steampunk basics like Victorian fashion, giant steel constructions and advanced mechanical vehicles. It shows an alternative path in time where the culture and science of the late 18th century was never ousted but developed to their maximum. The fictional aspect of Steampunk is a great challenge. Everything is possible but it has to work within the physical rules of old knowledge. I hope that some fans will gather here. Your input is important. So let’s make Nordenfelt an enjoyable game!